As promised, here is the rest of this very large Space Marine Army. This is the first order in a unique color scheme that crosses over multiple codexes. 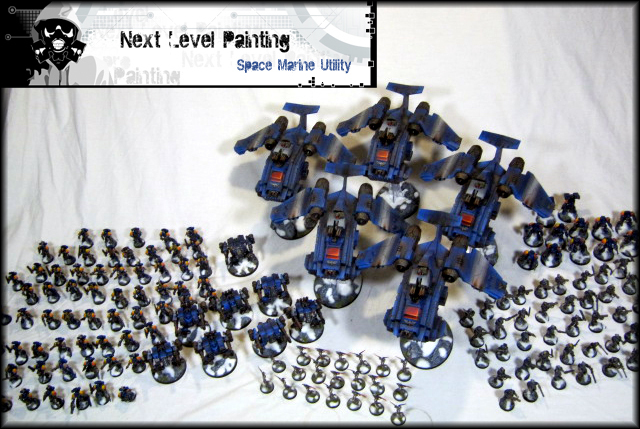 This force will optimize utility between various types of armies including Imperial Guard, Grey Knights, Space Marines, and Space Wolves. 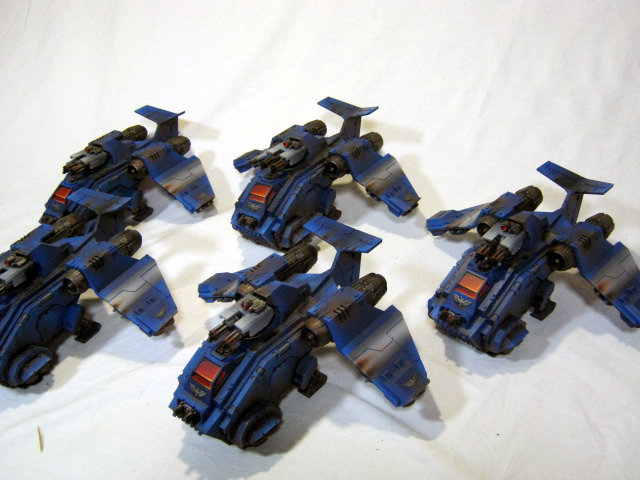 What you see are many Wolf Guard with Storm bolters and many Terminators magnetized to have Cyclone missile launchers. 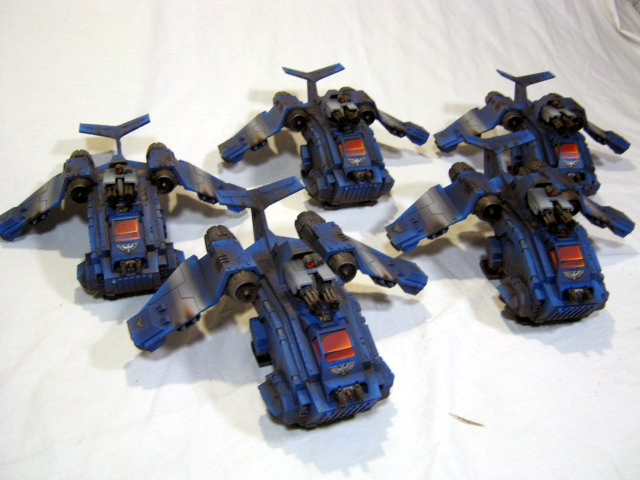 All the Dreadnoughts include magnetized arms and multiple weapon options as well. Click the pic above to open a tab with the Gallery. Thanks for checking us out. Here's a couple cool shots to whet your appetite of more things to come. They all sport magnetic resin turrets so they can swap out all the various weapon options. This custom chapter sports a unique color scheme and theme. Stay tuned for more exciting updates featuring this force. The new Necrons have arrived and our first swarm of undead robots take the field. This repeat customer had really admired the vibrant blue paint jobs on some of the Space Marine Librarians featured in previous galleries. So he decided to commission an entire army with the same stunning colors. In contrast to most Necron armies, there are no metallic paints used, just smooth blends and highlights throughout thanks to the airbrush. 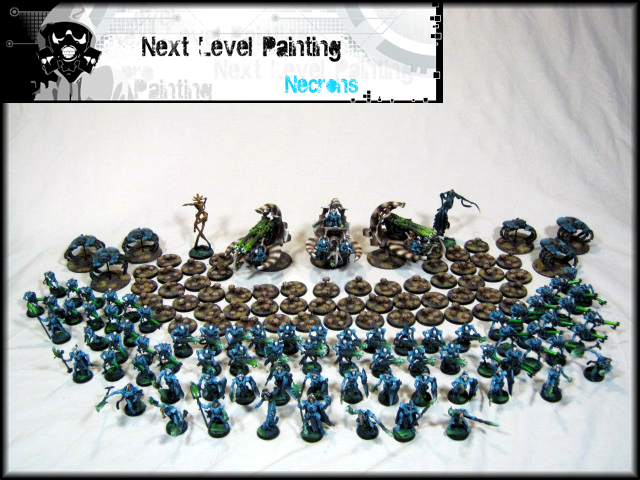 Be sure to click on the pic above to see close-ups of all these models and the unending Necron swarm.